Recorded in Japanese literature for hundreds of years, the act in rural areas of discarding old people due to economic necessity was contrary to the expectations of filial piety more prevalent in the other prints of the series. Here, under an autumn moon, a peasant carries an old lady on his back up the mountainside. 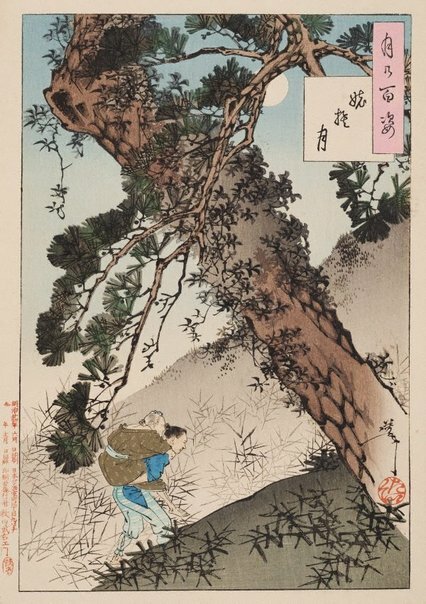 The small figures, dominated by a landscape (as in 'Red Cliffs') are portrayed against a gigantic pine tree, which is a symbol of longevity. In one of the stories about this subject 'Yamato monogatari', a man from Nagano province, deserts his aunt in the mountains, but is forced to return to her out of guilt.